The B Historic had me hooked at one of its lobby’s most stunning artworks, a purple-hued backlit cloth, soaring almost floor to ceiling and blowing gently in manufactured wind, featuring the words of Savannah poet Conrad Aiken. It’s a poem called “The Window.” I happen to be a missionary for the underappreciated Aiken. “It’s my favorite thing at the hotel,” says hotel manager Frank Dolley, who met me under the words “She looks out in the blue morning and sees a whole wonderful world.” And what a whole wonderful world that poem’s character would enjoy if she were staying at this Savannah-inspired oasis of calm, where coastal touches caress every corner. “I also love the bar, the woodwork,” says Dolley, referring to Kitchen 320, the hotel’s locally-sourcing restaurant and bar that’s getting accolades of its own, creative and Southern-inspired as it is with delicious delights like Low Country paella. The restaurant and bar’s central visual focus is a set of wood stumps, cut out and stacked, almost floor to ceiling, a nod, perhaps, to the state’s $681 million timber industry or, perhaps, to Savannah’s maritime history. 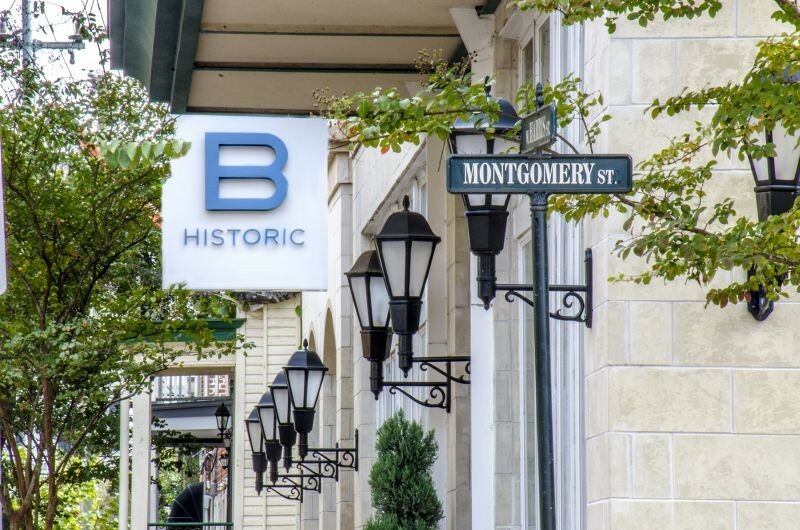 All these local touches, art and personality definitely mark B Historic as a boutique hotel, of which there are several in Savannah. Of course, as with any branded enterprise, the hotel’s corporate structure determines a lot of its feel. There are actually four other B Hotels and Resorts: Orlando, Ft. Lauderdale, New Orleans and Marathon Key. They pride themselves on their “DNA,” which stands for Destination (localism), N’Vogue (art) and Approachability (great staff personality).